Founded in 1921, The Town Hall is a non-profit National Historic site in the heart of NYC's theatre district, with a line-up that features events ranging from world music, jazz, gospel, blues, folk, show tunes, political humor, theatre, dance, its critically acclaimed Broadway by the Year, and more. 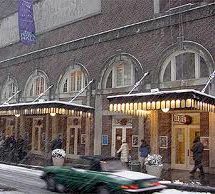 The The Town Hall is one of the top New York City venues for concerts and other events. Don't miss some of the biggest names in music as they come to New York City area's The Town Hall to perform live.